I've actually been keeping them for the past few months in another sand-based tank, but its currently being rescaped, so i transferred them over to this tank. I wasn't keen on letting them dig into the soil substrate in this tank and mess up the plants though, so i created a suspended "sand bed" for them to live in. Its basically made from an acrylic feeding dish filled with a layer of sand and attached to the glass wall. 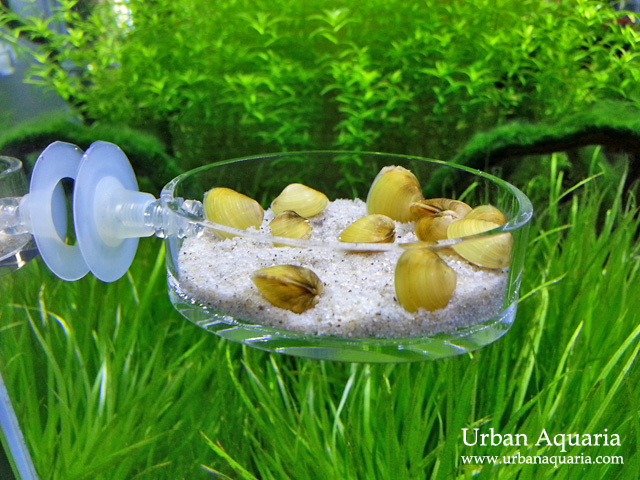 The sand bed is positioned in the path of the filter flow, as these clams are micro filter feeders and do best with water constantly circulating around them. Hi! Where did you buy the clams? how you make the stopper to the food dish? 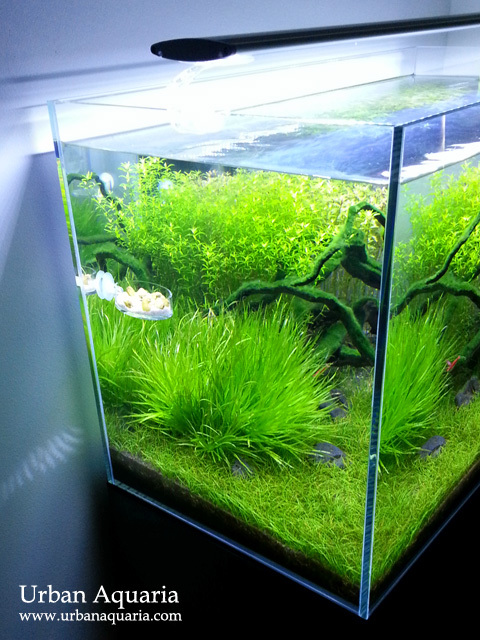 I bought the golden clams from Clementi Florist and Aquarium (aka C328) in Singapore. how are the clams doing today? any noticeable growth? Well, i've since given them away to a friend to put in his tank, so they are no longer with me anymore. Nice idea of making a separe sand pool for clams! I used to keep clams in the past and I faced a problem of proper feeding. I figure they would suffer continouse food deficiency in a sterile tanks similar to those you showed above. How did you feed them? Yeah, i guess it depends on how established the tank is... the vital thing these filter feeders need is a good population of suspended phytoplankton and zooplankton in the water column, not necessarily a "dirty" tank, but mainly a tank with a stable biologically rich ecosystem. Densely planted tanks that have been running for more than 6 months would usually have achieved that sort of ecosystem, so its possible for clams to live and thrive in those environments. The size of the clams vs tank size also matters too, the ones i kept were small juveniles (less than 1 cm in size), so they require much less food to sustain their growth, compared to larger adult clams. It means you never added any food for them only? well noted about sufficiency of ecosystem. My tanks were rather dirty community tanks and clams lived there more than a year till I added a medication against planaria. All other molluscs (tuberculata, granifers, physas, planorbis) survived with no harm to population. Yeah, i never specifically target fed them... the clams just filtered their food from the water column, i guess my tanks have sufficient suspended food supply for them to consume. I do try to cordon and position the clams directly in the path of fast water flow from the filter output though, so that probably helps making things easier for them. Specialized filter feeders like clams are indeed very susceptible to dosed medications or treatments as they ingest it directly from the water column, so it affects them much more severely. The other molluscs and snails can withstand and tolerate those dosed treatments much better, so they don't encounter as much issues. For this reason, if i have to medicate or treat a tank, i usually shift the clams to another tank to live temporarily.